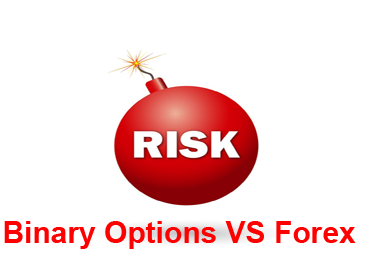 Binary option trading is most risky than Forex trading! I think binary option trading is most risky than Forex trading,because need more knowledegment about analysis to avoid losses, that’s why Forex more simple and can be as style of trading long or short also many difference In Forex trading, traders must invest some capital as margin with a value corresponding to leverage an option trader. Trader also must increase funding if the experience of floating loss while margin traders are in a particular position. This must be done or the trader concerned is not able to continue the transaction. While on investment binary option is not applicable margin system so that the trader will never experience a margin call and many Different Forex binary option associated with the profit opportunities or risk of loss, is, on investment Forex trader can not confirm the amount of loss when trading experience loss, including the amount of profit if the deal is successful. While in investment since the beginning of binary option trader has to know the magnitude of the risk of losses to be borne before entry, also the amount of benefits to be derived after the expiration time or deadline.